Your eyes do not deceive you. 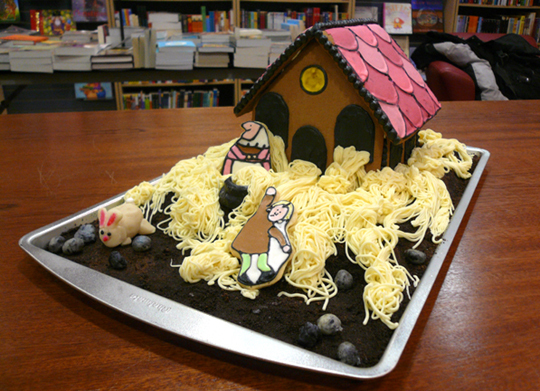 That is a Strega Nona gingerbread cottage, complete with out-of-control marzipan pasta. It was created by the talented Jen Carson of Jen’s Cakes & Pastries (with assistance from her 3 children). 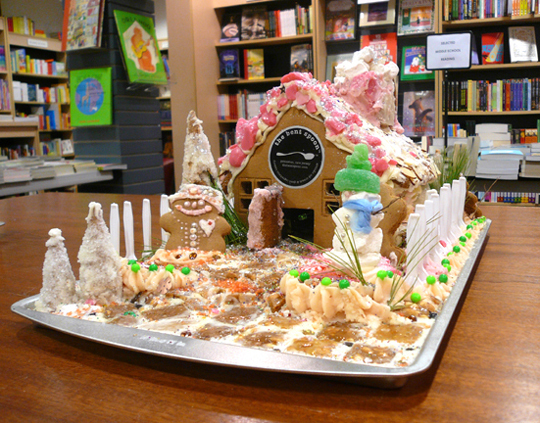 This cottage was a contender in a Hansel & Gretel Gingerbread Cottage Challenge we hosted in collaboration with Labyrinth Books, our local bookstore. 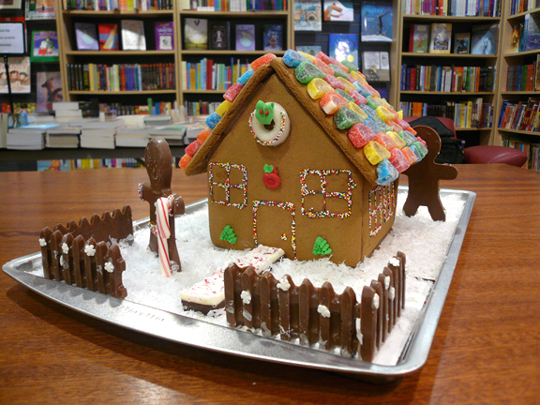 The premise was simple…exactly what makes a gingerbread cottage enticing to little boys and girls? Inquiring witches want to know! So we gave five local bakeries, cafes, and caterers the same gingerbread house kit, and challenged them to create the most enticing gingerbread cottage they could. Then we displayed the houses in the children’s section of local bookstore Labyrinth Books and invited kids to stop by and vote. The winner got to select his/her favorite children’s book. Then we purchased two copies of the book. One copy went to our children’s gallery, and the other was donated to the Princeton Public Library. The winning cottage came complete with a multi-tiered nut brittle walkway, sugary trees, stunning snow people, an almond-shingled roof, a mini-spoon picket fence, a chimney with marshmallow smoke, interior lights, and tons and tons of glittery snow icing – weighing in at a record 11 pounds! 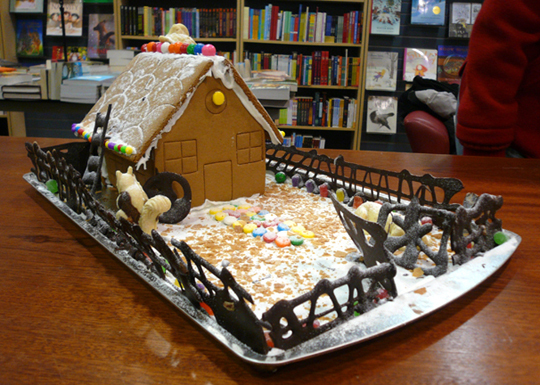 The Strega Nona cottage came in at a very close second (a mere 4 votes behind). The winner’s book selection? Charlotte’s Web by E.B. White. Coordinating this program was a snap. I purchased the gingerbread kits at Bed, Bath & Beyond (using a handful of 20% off coupons of course). Make sure you buy an extra house in case one of the other kits needs a “replacement part.” I bought some inexpensive cookie sheets from Target to act as bases for the houses. Then I whipped up some voting cards, collected the houses, and watched as children arrived to ooh, ahh, and debate over which house they were going to vote for. 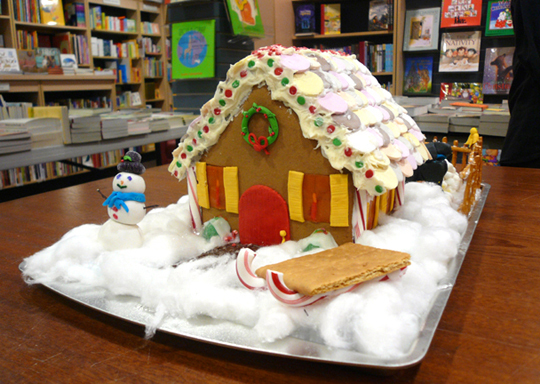 This entry was posted in More Connections and tagged contest, gingerbread, gretel, grimm, hansel, house, library, strega nona by Dana Sheridan. Bookmark the permalink.